Looking for Heat Pumps Christchurch? Want your home or office to be warmer, but don’t know what kind of heat pump you need? We have decades of experience in Christchurch’s heating and air conditioning industry. Our friendly team can walk you through the entire installation process – from a free, no obligations quote at your home, to finding the right heat pump for you, and installing it with no mess and no fuss. Heat Pumps NOW are your accredited Christchurch heat pump specialists, and we genuinely want to help you with your heating solutions. At all times you’ll be talking to genuine heat pump installers who know what’s needed to solve your heating and air conditioning issues. You’ll only ever get genuine advice about your home heat pump needs. Heat Pumps NOW are trusted Mitsubishi and Fujitsu installers, which means we’ve met their strict accreditation standards. For your peace of mind, we are trained and tested professionals with the right equipment and skills to install your heat pump properly, so you’re covered by our 1 year labour guarantee, and the heat pump manufacturer’s minimum 5 year warranty. We can supply you with the biggest and best heat pump brands like Mitsubishi and Fujitsu. We can also supply Toshiba and Panasonic. If you want a particular heat pump make and model, or you’re not sure what you need, Heat Pumps NOW offers expert advice so you get the best heat pump for your home. 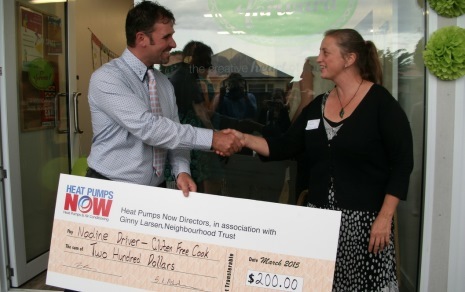 At Heat Pumps NOW, we really mean it when we say we love Christchurch and our community. Do you know an unsung hero? Someone who volunteers their time and works away for the good of others? Nominate them for a Heat Pumps NOW Community Hero Award. When the Neighbourhood Trust needed help with the heating and air conditioning needs for their new community co-op, Heat Pumps NOW stepped up and installed their heating unit at cost. Pay it Forward is a real community asset. It’s a place that displays and sells the goods made by local Christchurch artists, designers and artisans. Heat Pumps NOW was invited along to the big ribbon cutting ceremony. Check out our video of the opening night. Go in the Draw to Win a Free Heat Pump Clean! ​Subscribe to our newsletter and go in the draw to win a free heat pump clean! You will receive a monthly email full of valuable tips and interesting news. We also feature regular competitions and heat pump specials.